Background Several guidelines have been reported for bone-directed treatment in women with early breast cancer (EBC) for averting fractures, particularly during aromatase inhibitor (AI) therapy. Recently, a number of studies on additional fracture related risk factors, new treatment options as well as real world studies demonstrating a much higher fracture rate than suggested by randomized clinical controlled trials (RCTs). Therefore, this updated algorithm was developed to better assess fracture risk and direct treatment as a position statement of several interdisciplinary cancer and bone societies involved in the management of AI-associated bone loss (AIBL). Patients and methods A systematic literature review identified recent advances in the management of AIBL. Results with individual agents were assessed based on trial design, size, follow-up, and safety. Results Several fracture related risk factors in patients with EBC were identified. Although, the FRAX algorithm includes fracture risk factors (RF) in addition to BMD, it does not seem to adequately address the effects of AIBL. Several antiresorptive agents can prevent and treat AIBL. However, concerns regarding compliance and long-term safety remain. Overall, the evidence for fracture prevention is strongest for denosumab 60 mg s.c. every 6 months. Additionally, recent studies as well as an individual patient data meta-analysis of all available randomized trial data support additional anticancer benefits from adjuvant bisphosphonate treatment in postmenopausal women with a 34% relative risk reduction in bone metastasis and 17% relative risk decrease in breast cancer mortality that needs to be taken into account when advising on management of AIBL. Conclusions In all patients initiating AI treatment, fracture risk should be assessed and recommendation with regard to exercise and calcium/vitamin D supplementation given. Bone-directed therapy should be given to all patients with a T-score<−2.0 or with a T-score of <–1.5 SD with one additional RF, or with ≥2 risk factors (without BMD) for the duration of AI treatment. Patients with T-score>−1.5 SD and no risk factors should be managed based on BMD loss during the first year and the local guidelines for postmenopausal osteoporosis. Compliance should be regularly assessed as well as BMD on treatment after 12 - 24 months. 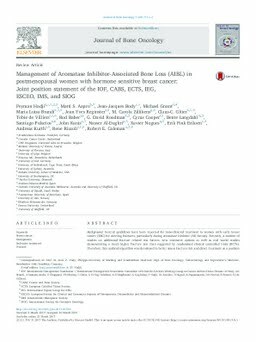 Furthermore, because of the decreased incidence of bone recurrence and breast cancer specific mortality, adjuvant bisphosphonates are recommended for all postmenopausal women at significant risk of disease recurrence.